It is no surprise that the last few years have been very lean in our house financially wise. We have had a child who has been sick for over 4 years and having no medical coverage sure can take a toll on your wallet. As a result, I have stepped up my frugal living and budgeting even more than ever. 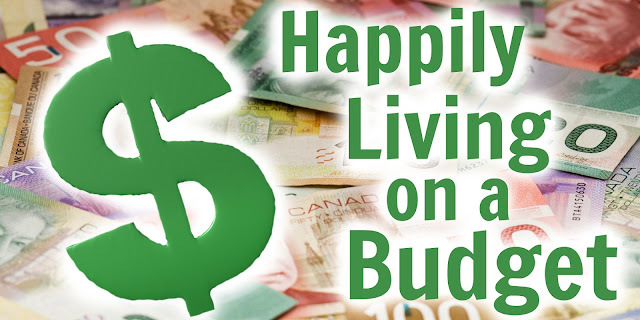 We are often asked how can we be so happy when our finances are so limited. What comes to mind the most is that my daughter is alive and living, so our money was well spent in keeping her alive. We are trying to get out of the debt we incurred while she was needing such expensive medication. Before I go any further she is still on medication but she does have partial coverage and the most expensive drug is free for her because she was accepted on a trial for the drug. Our monthly income is not extravagant to say the least. We live a very modest life in a small house with only the necessities that we need. I have found the easiest way to live on a tight budget is to not concentrate on what we do not have but appreciate what we do have. Our budget does not allow for any fun money for either of us and unlike a lot of other budgets I have seen and heard from others we have no dining out budget and guess what we are totally okay with that. We actually prefer homecooked meals over eating out any day. That is not to say we never go out to eat in a year but it is rare and we might go out about 2 times a year and it is budgeted. We also try to limit what we spend on eating out keeping it as close as possible to $30 as we can. Almost 4 1/2 years ago we moved from a 1600sqft house to a 1000sqft apartment which meant getting rid of a lot of things. We sat down and went through the items that we needed to live our life and the items we didn't need. Over the 2 months of preparing to move, we got rid of a lot of possessions and I can say I haven't missed the items one bit as a matter of fact I can't remember what the items were. Today I also find that I keep track of items we have not used and we either donate them or give them away to others who might need them. Fast forward to now we are now in an even smaller house than our apartment was and we are still just as happy if not happier. For me it was all about putting our budget in perspective and look at what we have. I do not feel like we do without at all. I find as a family we are closer than ever because we do so much together on a daily basis without the noise of stuff. What are some free things you do with your family?